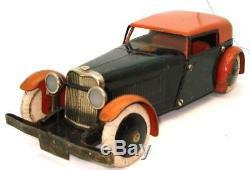 AN ORIGINAL 1930'S MECCANO CONSTRUCTOR CAR NO. 8 INCHES LONG - ALL METAL. FULLY WORKING ORIGINAL WIND-UP MOTOR WITH KEY. ORIGINAL MECCANO DECAL STILL ON THE HOOD. NO FLAT SPOTS ON THE TYRES. The item "MECCANO CAR CONSTRUCTOR SET NO. 1 1930'S CLOCKWORK ULTRA RARE" is in sale since Thursday, November 22, 2018. This item is in the category "Toys, Hobbies\Vintage, Antique Toys, Games\Play Sets". The seller is "traffictoys" and is located in Melbourne - real Down Under !.